Use this form to tell me a little about your project. In order to assure that I can design and install what you need, when you need it, and on what you need it designed and installed on, I'm going to need a little information. This way I can check the studio schedule, check delivery dates and keep the process of your project running as smoothly as possible. Feel free to be as detailed as you like, but if your idea is just a general one, that's OK too. I've worked from very detailed instruction, all the way to "Hey man, just make it look cool." 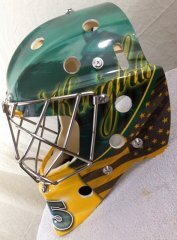 The Outer Layer is dedicated to creative and unique vinyl-based skins for hard-to-fit applications, like goalie and softball catchers masks. Copyright © 2017 OuterLayerSkins.com. All rights reserved.